CSS3 Styling Table with Pseudoclasses is new feature in CSS 3 that make your style more advanced and programmable. 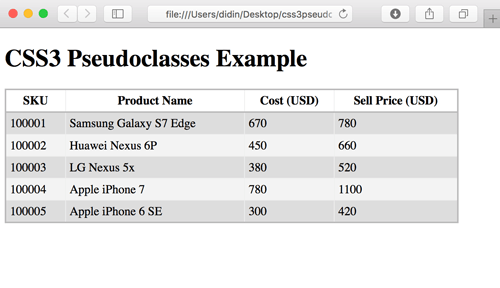 CSS3 Styling Table with Pseudoclasses by selecting an element in the more advanced way. For example, we select an element based on their event as select <a> element onmouseover event can using pseudoclasses a:hover. Let's create a simple example. First, we have to make an HTML file with a Table inside it. 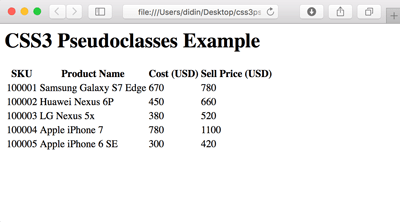 To make a row background color changes when mouse over it, we will use ":hover" pseudoclass. This CSS style also makes our table nice look than before. And now when your mouse over a table row, color will changes. Now we are making table rows looks like zebra stripping, different background colors on each even and odd row. This done using nth-of-type(event) and nth-of-type(odd). For making specific columns has different text alignment, we are using pseudoclass nth-child(column) for the specific column where (column) is column position by number. And also we are using last-child pseudoclass for the last column. 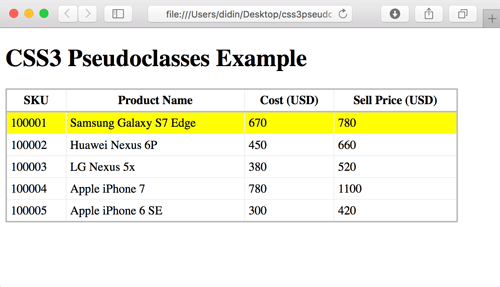 In this example, we will make cost and sell price text alignment in right. Now, columns of cost and sell price alignment to right.